I have just gotten off the phone with Dr. Schankin from UCSF. There have been several patients within the last few months who have qualified, set up test dates, and then canceled due to "scheduling conflicts." So here we are with 4 weeks lefts in the testing window. Dr. Schankin's time at UCSF will be done in August, and he needs several months to analyze the data. We need 2 more patients. Dr. Schankin is back in town and he said that while he was away he had about 60 patients contact him about being interested in the study. This is fabulous news, but also means that it is going to take the remainder of this week, and possibly next week for him to get in contact with everyone. If you are waiting to hear back from him, please allow more time. I will have him tell me once he is done contacting everyone and I will let you all know. That way if you still haven't been contacted by that point, we will know that your email was missed somehow and I will pass along your contact details to him. Thank you! I'm really hoping that our remaining 6 patients that need to be tested are amongst those 60 that he needs to contact! Eye On Vision NEW Facebook Fan Page Just Launched! 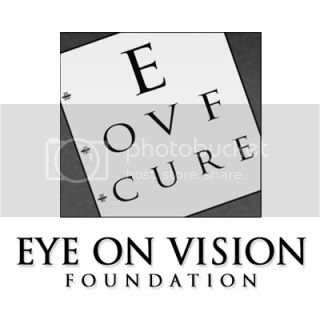 Please "LIKE" the Eye on Vision Foundation. You will be supporting a non-profit charity that strives to raise funds and awareness for research into vitreous floaters, macular degeneration, and visual snow. I have recently come across a very inspiring foundation, Hope For Vision. They are dedicated to funding the development of treatments and cures for blinding diseases. Their founder, Isaac Lidsky, young father of triplets, lives with retinitis pigmentosa and is committed to finding a cure and/or treatment.? As we are all to well aware of, millions of Americans are going blind every day due to retinal degenerative diseases, retinitis pigmentosa, macular degeneration, and many others. It can happen to anyone you know, a co-worker, child, parent, neighbor, or even yourself. Medical costs are staggering for vision loss. The National Eye Institute recently reported in a study that the nation spends over $67 billion annually due to the direct and indirect costs of vision loss, which is more than 100 times the annual budget of the National Eye Institute at the National Institutes of Health. Simply stated, there is not enough money to help those who have already lost their vision, or enough funding for research to prevent future blindness. While science has made many succesful breakthroughs, such as the restoration of vision in human trials employing gene therapies and biotechnology prosthesis, the main obstacle in delivering these treatments to the people who need them is the availability of research funding. Hope For Vision is made up of thousands of dedicated volunteers and vision advocates in Communities of Hope across the country. These volunteers raise funds through special events and other activities.? A staggering 90+ percent of funds raised go directly to researchers at leading medical institutions nationwide.?? The Eye on Vision Foundation is trying to raise awareness on how important organ donation can be. There are two very important sides to organ donation. The first is saving lives (usually many lives) and the second is crucial medical research. Organs not suitable for transplant can be used in medical research, which in turn has the potential to also save lives and improve the quality of life for those still living. Consider signing up today! I've been speaking with a research doctor, and he said that donor eyes could play a crucial part in researching a treatment for vitreous floaters. Many neurologists have come across patients with visual snow, and have little to nothing to offer them because so little is known about the condition. VS should not be confused with normal entopic phenomena or vitreous floaters. While these two conditions also cause you to see spots and floating objects, this is not the same as VS.